Near the tiny town of Bull Valley, Illinois is perhaps one of the strangest houses in northern Illinois. It was originally located far off the beaten path and remains secluded today along a quiet and mostly deserted country highway. George and Sylvia Stickney built this English country house in the middle 1800's. They chose such an isolated place for the peace and quiet and for their spiritualistic activities. Both of them were said to be accomplished mediums and they wanted to host parties and seances for their friends. The seclusion offered by the Illinois countryside made the perfect setting. The house itself was very unusual in its design. It rose to a full two stories, although the second floor was reserved for a ballroom that ran the entire length of the building. 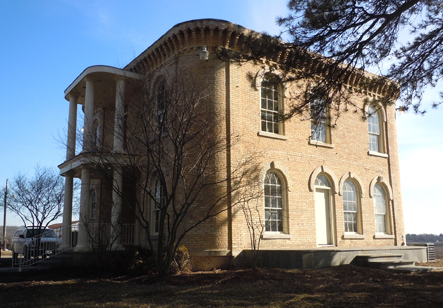 During the Civil War, the house also served as quarters for Federal soldiers and was home to the first piano in McHenry County. But this was not why the house gained its fame, or rather its notoriety. As devout practitioners of Spiritualism, the Stickney's insisted on adding distinctive features into the design of the house. These features, they assured the architect, would assist them when holding seances and gatherings at the property. Since the seances would be held quite often, they specified that the house should have no square corners in it. They explained that spirits have a tendency to get stuck in these corners, which could have dire results. It has also been suggested that the Stickney's believed that corners attracted the attention of evil spirits as well, a common belief in Spiritualist circles of the time. According to legend though, one corner of a room accidentally ended up with a 90-degree measurement. How this could have happened is unknown. Perhaps the architect either forgot or was unable to complete the room with anything but a right angle. Perhaps he thought that the Stickney's would never notice this one flaw. But they did notice! And here, the legend takes an even stranger turn. The stories say that it was in this corner that George Stickney was discovered one day. He was slumped to the floor, dead from an apparent heart failure, although no visible signs suggested a cause of death. Was he right about the square corners? Could an angry ghost, summoned by a seance, have been trapped in the corner? After the death of her husband, Sylvia Stickney lived on in the house and gained considerable fame as a spirit medium. The upstairs ballroom was converted into a large seance chamber and people came from far and wide to contact the ghosts of their deceased loved ones and relatives. Sylvia also claimed to stay in contact with her unlucky husband and her deceased children. Time passed and despite the seances and the mysterious death of George Stickney, the house never really gained a bad reputation until the 1970's. 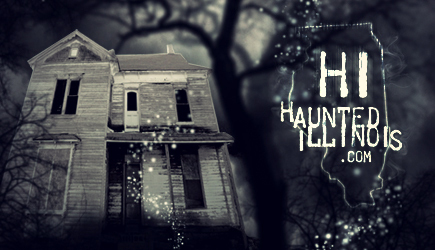 It had always been considered a strange and unusual place, connected to the spirit world, but it was never thought to be a bad one until a man named Rodrick Smith moved in. He lived in the house for several years and when he moved out, he began to claim that he had often heard strange noises in the place. He also added that his dogs were never comfortable there. This led him to believe that something was not right with the property. Smith's research led him to reveal that the house had become "tainted" by a group of "devil worshippers" who lived in it during the 1960's. He was convinced that their "black magic rituals" conjured up something unpleasant that now inhabited the house. It later turned out that the so-called "devil worshippers" were actually a group of stoned-out hippies who painted the rooms in dark colors and built open fires on the floors of the house. When they departed, they left spray painted messages and drug paraphernalia in their wake. While it's unlikely that they worshipped the Devil, Smith was sure that they had changed the atmosphere of the Stickney Mansion. He was certainly no help in getting the house sold but neither was one of the real estate listings that came after his departure. A local antique dealer would claim that he saw a real estate ad for the place in which a woman in a wedding gown could be seen pulling aside a curtain and peering out. The photographer who took the picture said that no one was in the house at the time. He also stated that he had seen no one at the window when he was snapping photos of the house. Was the woman a ghost? Eventually, the house sold and the next owners claimed to experience nothing unusual in the place. They stayed on for several years but moved out when their plans to restore the mansion didn't pan out. Their occupancy leaves nothing to suggest that they were bothered by ghosts and apparently, neither are the owners today. The local police department uses a portion of the restored house as their headquarters and claim nothing out of the ordinary. The official word is that, while the house was badly treated by vandals, it is not, nor was it ever, haunted. So, who knows? Some area residents dispute the final word from the authorities. They say that ghostly things have been going on in the Stickney Mansion for many years, and continue to go on today, whether the local police officers want to admit it or not. What is the truth? No one seems to be able to say and the ghosts, if there are any here, are certainly not talking!